The pearls used in vintage jewellery whether it be pearl necklaces, pearl & diamond earrings or bracelets etc. come in a variety of forms: seed, cultured, synthetic and natural pearls. 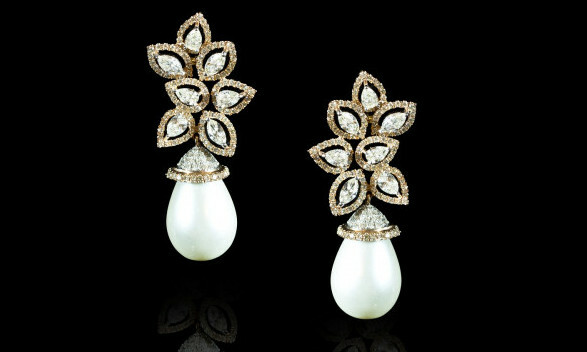 The type of pearl affects the value of the piece of jewellery greatly, with natural pearls carrying the greatest price. Establishing whether a piece of jewellery contains natural pearls is not always a straight forward process, however, there are a few tell-tell signs such as the quality of the clasp and the type of materials used within the piece. For example, if the jewellery is signed or contains valuable gems (such as diamonds/emeralds/sapphires/rubies and set within gold, white gold or platinum clasp/mount etc) the likelihood of the the pearls being natural increases. Surface: The clearer and cleaner will denote a higher value. A good pearl should have very few blemishes or marks. Shape: good round pearls are the most collected. The shape of a pearl can range from baroque, spherical or symmetrical. Size: Pearl sizes range from 1mm (seed pearls) to 20mm south sea pearls. The largest pearl recorded was a 26.95mm a baroque pearl from the south sea. Lustre: This is the fine glow that radiates from within the pearl, this produces the sheen which makes them shine or have a rainbow of colours. A pearl that does not have any reflection or is a dull colour is poor quality and a pearl with fine lustre is of good quality. A good pearl will reflect light. Colour: is a matter of opinion or taste. Rose pink, cream or black with overtones are often preferable, but, pearls can also be yellow, lilac, silver, gold or pink to black. Nacre: This is the substance which makes up the coating of the pearl. Nacre quality is an important element when determining a pearl's value. Generally, the thicker the nacre, the more valuable the pearl. Please read the following example to understand the process that can be undertaken to confirm the authenticity of potential natural pearl jewellery, thus increase the jewels value. 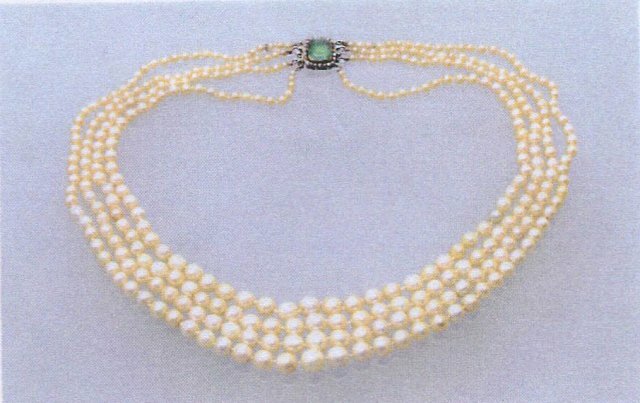 A graduated, 4 strand necklace of natural pearls with emerald and diamond clasp – successfully sold by Vernon Ward. A client came to visit me from London with a view to instructing me to act as her agent for the sale of some vintage Cartier diamond jewellery, amongst which was the above which was a family heirloom. She felt it was time for her to sell some of her collection and she informed me that the pearls once belonged to an overseas Royal Princess (good provenance if you have the documentation) and that she believed them to be natural pearls; a small problem comes with this unless you have a certificate such as, for example, from the Swiss Gemmologist Institute (S.S.E.F.). Without such a certificate they can not be sold as natural pearls. I was faced with the all-important task of the research necessary to achieve this authentication. First and foremost, I showed the pearl necklace to a perspective collector I knew, who is an expert in pearls, but alas, unless I came up with the certificate and provenance (having provenance would raise the bar by many thousands of pounds) he was sceptical of buying them as natural pearls. So, my first task was to have the pearl necklace sent to Switzerland to be tested. This can also be done in England but in my opinion a certificate from the S.S.E.F. is a key document when proving whether natural or cultured. Next, whilst the pearls were away being tested, I needed to source the provenance via the seller and me cross-referencing through my library of books. I hold a plethora of information on jewellery, I prefer checking books first and, it’s more enjoyable as well, but I couldn’t find anything to substantiate the story or who they once belonged to i.e. from a Royal Blood line! And without a letter, for example, left with the pearl necklace and handed down, it tends to fall on deaf ears when selling any items or jewellery, antiques, and works of art – unless provenance is 100% watertight it holds no value in the eyes of any would-be collector. I returned to the client in London and met up with her at her house and we enjoyed many hours together trying to see if provenance could be upheld. Alas no, it was not meant to be - for the month the pearls were in Switzerland, I was still confident that the pearls were “Natural”. Despite enjoying the company of “The Lady with the Pearl Necklace” as we searched for provenance we came to a dead end. After a month, I received that all important S.S.E.F. 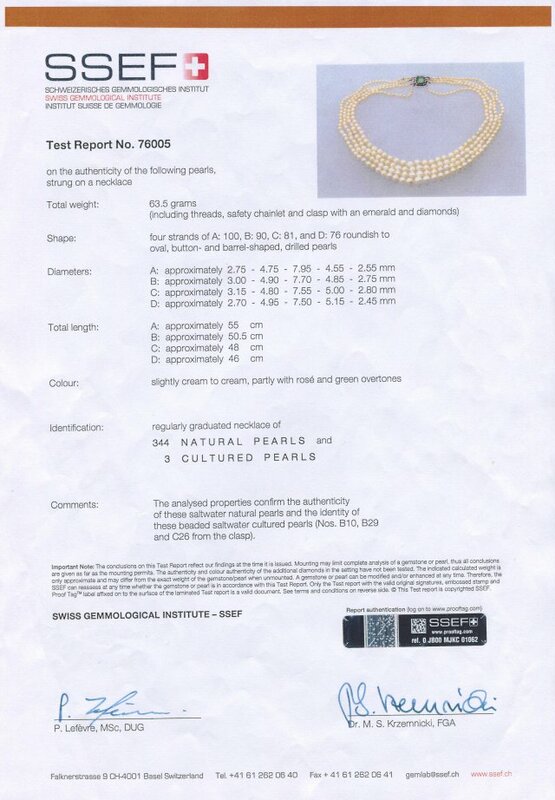 certificate, together with the necklace returned, confirming they were 344 natural pearls and 3 cultured. Excellent news – my instinct had been right. Anyway, this certificate set the bar into selling an excellent 4 strand natural pearl necklace. I returned to London armed with my certificate and the vendor was absolutely delighted. They were sold to a private buyer for an undisclosed sum smashing all previous estimates (it never fails to amaze me that some appraisals are often too low because proper research is not carried out). While I was sourcing a buyer, the client asked me if the diamond and emerald clasp could be made in to a ring for her so that she could retain a piece of the necklace and family history. I told her I completely agreed it was a great idea (mind you the emerald was worth a few thousand pounds on its own let alone the diamond surround!) I had it made into a beautiful gold emerald and diamond ring and she still has it to this very day. contact me to arrange a free home consultation.